Sunset Pictures on the coast of Maine are spectacular. The Maine coast is known world wide for it’s beautiful rock formations, sea grass and sandy beaches. The great thing is in many cases you can get all three on one beach. This month my favorite Family Beach Portrait was on Fortunes Rocks Beach in Biddeford, Maine. 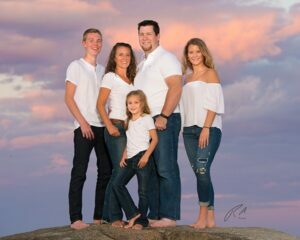 We kept close to the southern side of the beach at low tide for this great shot of the family on the rocks with the sunset light hitting the clouds behind them. It’s not everyday we get these kinds of clouds on one side and the sun on the other but, I guess the stars lined up for this lucky family. So what goes into the creation of a sunset picture that makes it truly beautiful. Well, for those who are interested I will give you a few tips. First, you need a well put together wardrobe for the family. Here they have chosen white shirts and blue jeans. This is a classic summer look that just doesn’t get old. The colors work with the beach and the sky. Blue also works well with the yellows from the setting sun on the rocks and white shirts in the form of warm tones. Second is a beautiful sunset. This is often better in the summer when the humidity is higher. It allows for softer light on the family. Combining this with having the family at the correct angle to the sun can give a more three dimensional look to the family in the portrait. Then we add a little flash to slightly brighten the family and separate them from the background but still look natural. In this case that was a little difficult because they were on a rock that was 5 feet up. So we use a light stand that was 12 feet high. Finally we arranged everyone in a way that adds interest to the composition and moved the camera into a position that has the bright part of the clouds all the way around the heads. Ta da, we have now created a family picture that will be proudly displayed in the living room for decades. Here is a fun fact, eighty percent of all the families that hire me have never done a professional family portrait. 100% percent say it was worth the effort of getting all of the clothing together and clearing every ones schedules for 2 hours on the beach. So what is stopping you??? Get your family portrait done by a master photographer on the Maine Coast!!! Call Today!! 207-251-2739 To find out more about Family Portrait on the Coast of Maine.